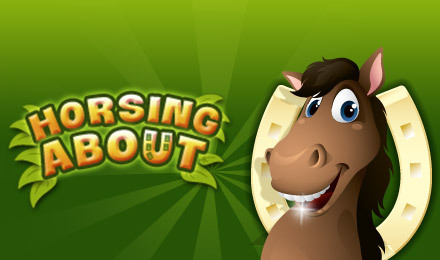 Horsing About Slots is one of the top UK slot games at Wicked Jackpots! It has a fun theme and loads of chances to win! There are horse themed symbols, Wilds, Scatters and more! Horsing About is full of lucky horseshoes, cowboys, riding boots and more horse-themed symbols. There are 25 paylines, rewarding bonuses, special symbols and loads of fun! Your Wild is the Cowboy Hat and the Horseshoe represents the Scatter. The Wild can take the place of any symbol except for the Horseshoe, and when it appears in a winning combination, it will double your wins. You'll hit the jackpot when you spin 5 Hats in one payline. The Horseshoe triggers your FREE spins when 3 or more appear on the reels. This bonus round can also be retriggered giving you loads of chances to win!